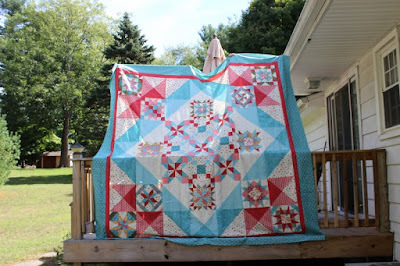 At the end of July I started on this quilt. I worked for about a week sewing most of the days to get the 12 main blocks done. I guess I felt I had accomplished enough and I put aside and my focus went to genealogy for a month or so with some success taking one line back a couple of generations. I decided this week that I needed to finish the top. 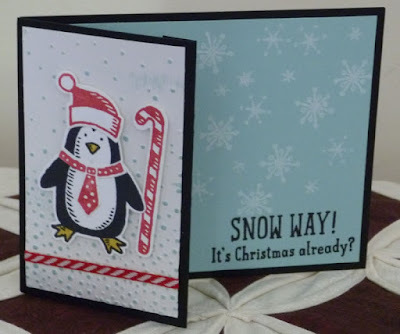 I want to start working on Christmas cards and I don't want to risk getting something on the fabric while it sits waiting for me to get back to it. I still need to quilt and bind it but the top is done and I'm happy about that. Now to start those Christmas cards. Thought I'd share a quick, inexpensive and easy craft today. The snowmen are kind of cute to add as a decoration in the winter. I need to swap out the hats and scarves because they don't match and I would like some brighter colors, but you get the idea. The wood for the snowmen is 1-1/2" x 1-1/2". 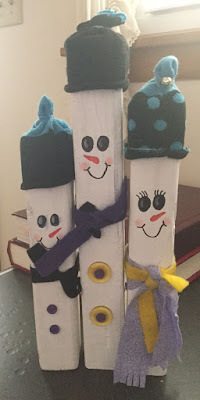 The tall snowman is 11-1/2", the middle snowman is 9-1/2" and the smallest is 8-1/2". A quick coat or two of white paint on the wood. Once the paint is dried, you can decorate the bottom with buttons, use felt for the scarves and the hats are baby socks! The two smaller snowmen have the toe of the sock and the tall one has the leg part of the sock. Gather it at the top with an elastic and use another elastic to secure it to the wood and roll the sock up a little for a brim. The middle snowman has a bead glued on for an embellishment. I want you to take a good look at the penguin panel. You can see a notch in the black cardstock. That panel holds a gift card! So stinkin' awesome!! Back in April our niece took her life. It was heartbreaking for her family and family and friends, understandably. She was so young at 19 years of age to feel so much sorrow and that ending her life was the answer. 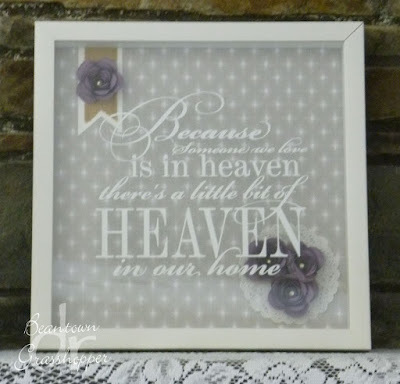 Shortly after I saw the quote "Because someone we love is in heaven there's a little bit of Heaven in our home." I'd seen it before but it didn't mean as much to me then. I also saw a frame done that said "welcome to our home". I merged the two and am sending this off to my sister-in-law. My niece's favorite flower is a hibiscus. I tried several different ways to make them but they just don't look good and with the stigma extending so high, it looked wonky in the shadow box frame. I decided to go with the purple roses because purple was Bria's favorite color. 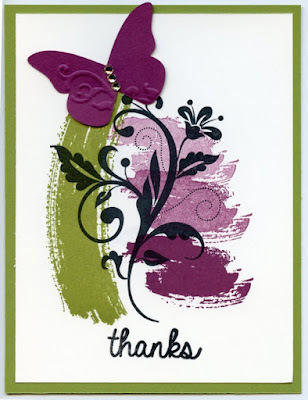 I hosted the Special Occasions swap on VC Rocks last month. The card fronts could be sympathy, baby, wedding, etc. It was pretty much an anything goes type of theme. The only requirements were that it had two layers and an embellishment.